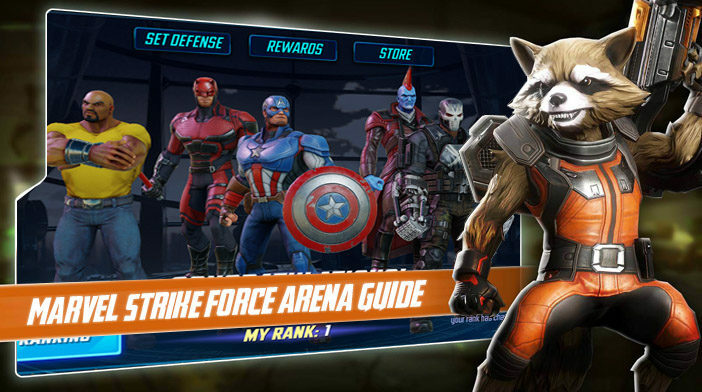 Welcome to Marvel Strike Force Guides page. This is the full description of MSF Arena segment with all information regarding it. Hello, Marvel fans! Today we will talk about Arena, a PvP segment of the Marvel Strike Force. The Arena is unlocked when the player reaches level 30 and you are immediately placed on the server with 10 thousand players who have similar progress as you or started the game at the same time as you. You are starting on place 100000 and by winning one of three suggested opponents you are ascending on the Arena ladder. Most of the players find that the Arena is the only accurate indicator of someone’s strength in Marvel Strike Force (which is not true) so be prepared on a long and complicated journey to rank number 1. When you open an Arena screen you will see several things. In the foreground is your current Arena team. Above your team, there are three tabs: “Set Defense”, “Rewards” and “Store”. On the bottom left there is the overall ranking tab, on the bottom right there is a “Go”, and in the top right corner you can see (from right to left) amount of power cores, arena credits, and attempts. When you click on “Go”, the selection screen will appear where you can choose your opponent. You will see the ranking and team power of possible targets and how much time left until the next attempt. You have 5 attempts per day and you should use them wisely because every day before resetting your ranking is counted and depending on your rank you get Arena rewards. After you choose your opponent you will fight with his team and if you win you will take up his ranking position and loose 1 attempt or you will just lose an attempt if the enemy team prevail. On the “Store” screen you will see available heroes and minions who can be bought for Arena credits. Those are Deadpool, Scarlet Witch, Mordo, Drax, Quake, Daredevil, A.I.M. Researcher, Hand Archer, and Shield Security. 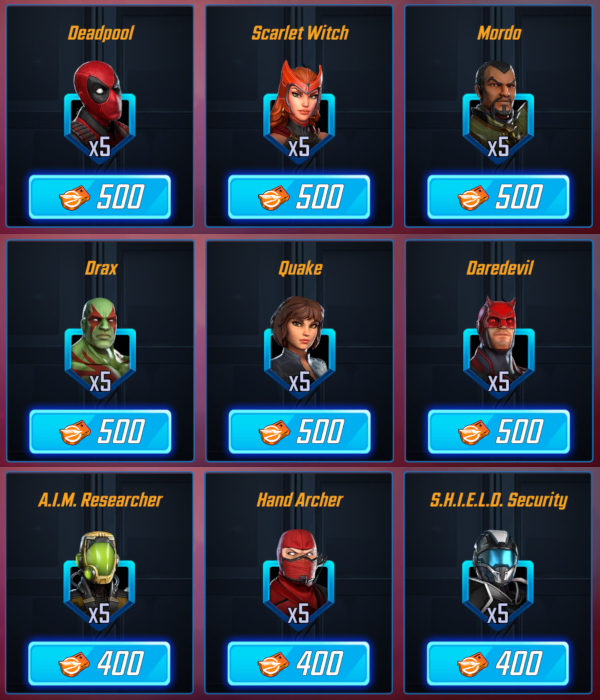 If you are a new player, I suggest that you go after Daredevil, Drax, and Quake as soon as possible and then to invest all your Arena credits in Quake or Daredevil, although you could upgrade Drax to five stars if you want to chase Star-Lord and Guardians team. “Ranking” screen provides you with the information of first 100 players on Arena list and you can also see your ranking along with information about 50 players ahead of you and 50 players behind you. This could be useful if you want to know the composition of teams which are controlled by players who have a higher rank then you. “Set Defense” screen allows you to choose a team which will fight against other players who wants to assault your ranking position. “Set Defense” is very important because when you master how computer controls your heroes you will know that your defending team must be chosen with care and you will often replace your standing heroes with the new ones. What is best MSF team for Arena? The most frequently asked question is what is best Marvel Strike Force team for Arena. The answer is not easy because every player thinks that his strategy is the best and support his opinion by his ranking position. If you are a free-to-play player you will often think that your actions are limited and that there is no way for you to beat players who invested money in their teams because their power is ten or twenty thousand higher than your team power. Well, that is not entirely true because it is possible to beat those teams since they are controlled by a computer who doesn’t use heroes skills in an appropriate way. My Arena team composed of Kingpin, Crossbones, Vision, Hand Sentry and Yondu with the power of 137k easily wins against the same team with the power of 170k so don’t be afraid to attack higher ranking players if you have good team composition. My team composition is good but I must avoid teams with Vision and Dr. Strange. Vision is a controller who can cast Ability Block on primary and 1 adjacent target in the first turn and who has AOE ability which inflicts medium damage and clears 2 random buffs from all enemies. The sole purpose of Kingpin is to cast his ultimate in the first round and apply Defense Up and Offense Up on all allies. Crossbones is one of the most used characters from the BETA release because of his ultimate which literally devastates anyone on the other side of the screen. Yondu is fast, he can remove buffs and he has decent AOE ultimate which can be cast in the second turn. Hand Sentry is used for protecting a team with mass Stealth and mass Evade. The strategy is to release Crossbones', Yondu's, and Vision's ultimate in the second turn while they are under the effect of Offense Up. That combo destroys almost any team composition who is fighting against you. Vision is fastest so his AOE will be cast first and he will remove any buff enemy Heroes have. Yondu will play after him and he will open enemies for the final Crossbones' AOE. Crossbones under the effect of Offense up does up to 40 k damage to all enemies. His AOE strikes all even he is blind or the enemies are in Stealth. However, when I fight against a team with similar team composition as mine (Hand Sentry, Kingpin ...) I use Wasp instead of Vision since Wasp has also AOE in the second turn and her AOE can strike Stealth targets and remove evade before Crossbones' ultimate. As I said before counters for this team are Vision and Dr.Strange. Vision can use Ability Block on Kingpin or Hand Sentry in the first team preventing you from unleashing your AOEs under the effect of Offense UP. Dr. Strange, on the other hand, can flip all positive effects into negative and that is the ruin for my team. That's why it is important to have more than one team for Arena, so you could answer any threat you face. But keep in mind that getting to rank 1 is easy and keeping the rank 1 is very, very hard. That is because you don’t lead your heroes on defense but the computer does. For keeping the first and any other place you will need several things. First, you will need to have power high enough to drive off anyone who wants to take your place (I don’t know why but people avoid attacking players with higher power). Second, you must have luck – yes luck is important when 1 critical decides between a win or lose. And third, you must have a good team composition for defense. My advice is to never use Quake or any supporter in defense team because Quake is useless when controlled by computer and no healer can save hero who is a target of other player’s whole team for 2 turns so the healing as a skill is useless in Arena fight. There are several META Arena Defense teams at the moment but I will talk about one team combination I found very interesting and easy to obtain. You all know that Defenders team, Guardians team or S.H.I.E.L.D team owns the Arena but those teams are very hard to assemble especially if you are a free-to-play player. That is why I suggest Ms.Marvel, Luke Cage, Punisher, Daredevil, and Spider-Man be your Arena Defense team. All those heroes are easy to collect and they perform amazingly well together. Best of all is that A.I. can't make a mistake since all abilities are cast in an order you would cast it too. Daredevil opens the fight with his ultimate and he is assisted by Ms.Marvel after that Spider-Man apply Defense Down on at least 3 enemies and he is also assisted by Ms.Marvel than Ms.Marvel use her ultimate and she is assisted by Daredevil and Spider-Man and at the end, Punisher unleash his AOE while at least 3 targets are under the effect of Defense Down. After that combo, Luke Cage applies Defense Up making your team ready for anything that nearly dead opponents could deliver in the second turn. With a little effort, you could boost this team on 150k power since all characters are easily farmed (except Ms.Marvel). Of course, there are other possibilities for making good Arena defense and I encourage players to search for best solutions all the time. I hope that this little guide will help you to achieve the highest rank possible in the Arena. If you have a different opinion or other Arena tactics, feel free to give your opinion and I will answer. We hope that you enjoyed the description of MSF Arena segment. For detailed information about other MSF Segments check our MSF Guide page.